Yesterday Joshua Bernstein, author of the recently released The Complete Beer Course, brought about 25 beer geeks, homebrewers, and curious travelers to my apartment to sample some homebrew and pick my brain. Besides making some cool cash, it was also exciting to get to share my beers with many people all at once who were interested in discussing it and noting what they tasted and enjoyed. Many of the stories I shared to answer peoples questions are already found on this blog, so I won’t recall them in detail. I explained how I began brewing after feeling inspired to create a blog that paired homemade pizza with homemade beer during a visit to New Belgium Brewery. In response to a question about whether I ever apply my studies in physics to brewing I gave a description of how Ekman pumping is the physics behind the whirlpool method. Josh was a great tour guide, providing some background on the base beer styles, as well as Brooklyn brewing history and news of its current revival. I shared the last bottles of both the Rye Wit and the Saison du Pom, which was one gentleman’s favorite beer of the tour and saw some inquiries about a second pour. I also poured Honey Season, the Rauchbier (which I’m currently working on a name for), and the dreaded Peanut Porter. I set out a bowl for tasters to dump any unwanted beer, and while many dumped out some of the Peanut Porter, many people were intrigued and even enjoyed it. After sharing it at a homebrew guild meeting, I was told I should highlight the fact that the slightly acetic character adds a jam-like tartness to the beer, and that I should instead view it as a PB&J beer rather than a Reese’s type beer. Much as I’m glad some tasters were able to find something worthwhile about it, a change of perspective isn’t cutting it for me with that beer. Since the Rye Wit is now all gone, it’s probably about time I got around to posting some tasting notes. Tasting notes on Honey Season and the rauchbier will come soon. Appearance: Hazy, though my pour was from the bottom of the bottle. In the past this beer has actually been surprisingly clear for a witbier. I’ve just finished reading Brewing With Wheat, in which the author emphasizes the challenge of creating the stable haze that wheat beers are known for. The beer pours with a strong head, which gradually settles into a few colonies of bubbles around the surface of the beer. There is a little lacing, but not much. Again I think this is more symptomatic of my small pour from the bottom of the bottle, and previous pours generated different results (unfortunately I can’t find my notes from earlier samples). Aroma: The nose is still yeast dominated, but the slightly sulfury aromatics that were off-putting to me a couple months ago have mostly abated. Unfortunately by the time I poured my sample, most of the aromatics had faded from the bottle. Flavor: A surprising punch of citrus that I hadn’t tasted at all in previous samples. There is still a definite Hoegaarden yeast character, but in contrast to previous pours, other flavors are more notable now. There is a subdued spiciness in the bottom end that outlasts the rest of the flavors, although I can’t say for certain that it is from the rye (as opposed to the yeast, coriander, or even the noble hops). 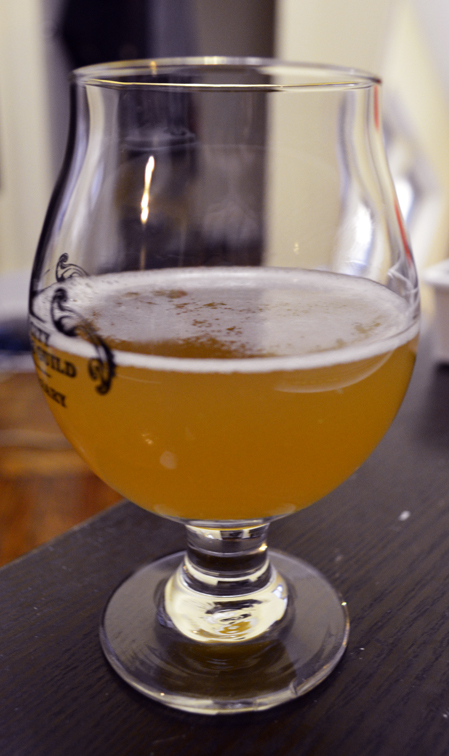 When I sampled the beer before carbonating it, the spice was more apparent and had more rye character. The beer has definitely gained complexity with age, though it still seems a little on the sweet side. The alcohol also seems a little hotter now that the yeast character is more subdued. Mouthfeel: Decent body, but I think it could be better. I’d like for the beer to be drier, but without being water. I think maybe higher carbonation could help, but the beer already feels a little foamy on the tongue. Perhaps I should’ve tried a more fermentable mash. Overall: This beer was alright. It never really excited me, but then again Hoegaarden doesn’t really excite me, so choosing their yeast was probably a fundamental mistake. Given that fermentation temperatures reached into the high 70s while I was out of town, and the yeast started giving off unpleasant odors, the beer has recovered nicely. Even if I’m not such a fan of this brew, it was well-received during the homebrew tour, at the beer swap at Bitter & Esters, and at NYCHG’s 25th anniversary party at Brooklyn Brewery. At that party, some of the attendees who tasted it even took down my contact information out of interest in the recipe. This entry was posted in beer, tasting and tagged acetobacter, Belgian, honey, narrative, peanut butter, pomegranate, rauchbier, review, rye, saison, tour, witbier on December 8, 2013 by Dylan Bargteil.